Harry's Boots, Founded in 1939, is a Boot and Western Wear Store in Historic San Saba, Texas. “We plan to keep the tradition of extensive inventories, quality merchandise, and competitive prices with authentic personal service to our customers, just as founders Ike and Harry Shapiro did. But you’ll also find exciting changes that have been made to this landmark located at the intersection of Highways 16 and 190 in downtown San Saba. New and expanded inventories of boots, hats, and clothing for the whole family are available at the restored landmark or home of Harry’s Boots. Harry’s story starts in 1907 when J. W. McConnell constructed buildings at 403 E. Wallace and 405 E. Wallace. One housed McConnell’s grocery store and the other housed the first men’s clothing store opened in 1917 by T.E. Gaines and E.E. Fagg. The two businesses operated until 1939 when Ike Shapiro assumed ownership, subsequently opening what is known today as Harry’s. Shapiro believed in extensive inventories, quality merchandise offered at competitive prices and authentic personal service. These principles embody the Harry’s culture and have cultivated long-lasting relationships for over three-quarters of a century. In 1941, Ike’s son Harry joined the business and, in 1970, purchased the circa 1907 building at 401 E. Wallace. Together, Ike and Harry Shapiro fostered a strong Texas legacy by offering the finest western wear and a large selection of boots. Harry served as store owner and manager after his father’s death in 1951. In May 1982, Harry passed away leaving his family to run the business until 1986. The family sold the building to two former employees, Lorena Terry and David Parker. The new ownership expanded Harry’s storefront space again when it purchased 407 E. Wallace in 1998. The new section dated back to 1885 and served as San Saba Hardware for many years. 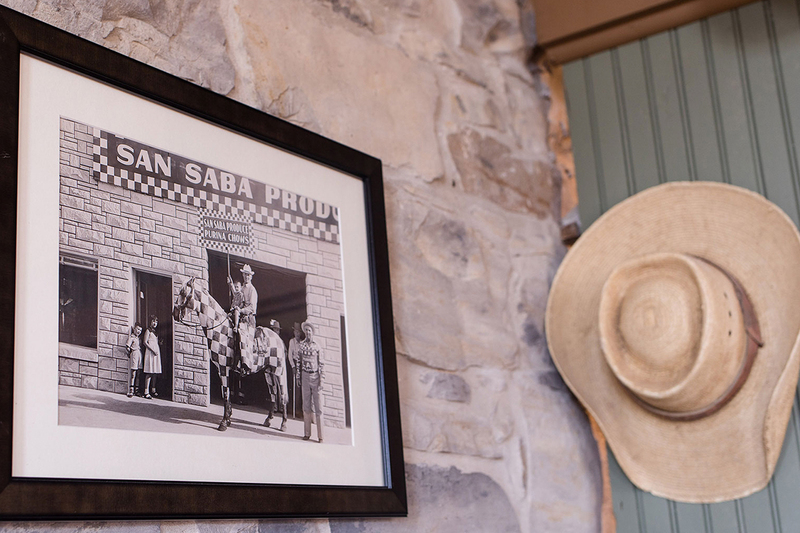 The hardware store was a gathering place of the local men and a history of San Saba’s weather was recorded on a back wall. In 2008, Ken and Kynda Jordan purchased the buildings and operate Harry’s Boots under its founding principles, with the intention of growing the Harry’s legacy. Harry’s expanded again in 2010 when the Jordan’s bought the 5th building. Harry’s is currently managed by their oldest daughter, Karoline Jordan. Through different owners, occupants and renovations, the turn-of-the-century buildings retain strong character and today are beautifully restored relics of their history. Currently, Harry’s is undergoing significant renovations and expansion. Three of the five buildings have been completed, which include the men’s boot room, hat room, work boot room and women’s room. The project included removing plaster from the outside and inside walls to reveal the beautiful native rock, refurbishing the original doors and floor, and adding new shelves & western accents. The goal of the renovations is the restoration of these historic buildings to their original beauty featuring the native rock, century-old tin tiles, original beams and archways that were aesthetics of original construction. Check in to see how the renovations are progressing.